Newsday's coverage of the corruption retrial of former Nassau County Executive Edward Mangano and his wife Linda. This story gallery also includes coverage of the first trial that included former Town of Oyster Bay Supervisor John Venditto. Linda Mangano sat at the defense table, crossed herself with shaking hands and held her rosary. Edward Mangano jotted notes and nervously tapped his hands on the defense table. His hands also began to shake. As the foreman rendered decisions on count after count, Edward Mangano, at one point, reached over to comfort his wife, Linda. "We had so much to go through," he said. "Most of us went in there with the intentions that they were innocent, but as we started going through, the evidence was just starting to reveal ultimately what became our verdict." 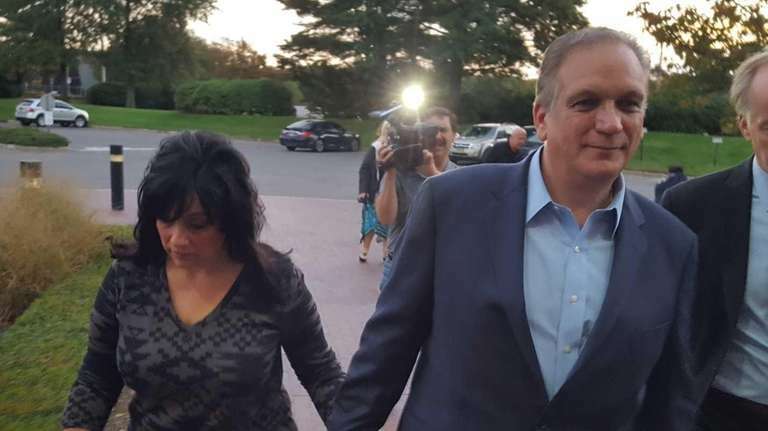 A jury has found former Nassau County Executive Edward Mangano guilty of corruption, while also convicting his wife, Linda, in the couple's seven-week federal retrial in Central Islip. The verdict came after five weeks of testimony and six days of juror deliberations in a proceeding that followed a mistrial in May. The panel of eight women and four men asked for testimony of two other prosecution witnesses as the fifth day of deliberations began. Jurors asked U.S. District Judge Joan Azrack for testimony from prosecution witnesses Jonathan Sinnreich, William Savino and Leonard Genova.